Here is a breakdown of what our company is and what they can do for you.Where do you want to be by the end of next year?Do you want to spend time working for a boss and make HIM money? (E)Do you want to spend time working for yourself and making yourself money? (S)Do you want to have OTHERS working for you to make YOU money? (B)Do you want your money to make you more money? (I)The people in (E) are spending their time earning other people money. And their jobs cannot be guaranteed in this day and age. Neither can the cost of living as the fuel prices increase, etc... People think there is safety working for other people. This can be self deception. The people in (S) are in control to a certain degree. But it takes a really long time to build a strong customer base plus you are using YOUR time to make money. That is fine, until someday when you are too sick with flu or something else to work and you don't earn money while you are in bed recovering. The people in (I) are very blessed to have the kind of money that takes to survive on the interest from investing in banks, etc. And I am sure very few of us are that blessed? We are going to look at the (B) group. Getting other people to work for you. You could own your own business and hire people to bring in clients and make money for you, but that will take a lot of Capital to do so, hiring of business property, purchase of stock to sell, etc. OR you can use the type of business that I am a member of at the moment! 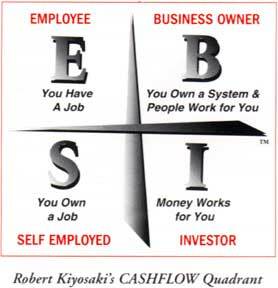 (E) you will be working with/for the company - This is until you have laid your foundation of people on level 1. The new Clients you have referred to the company. (S) you will be working for yourself as well. You are building your own base of clients so you WILL have to work at sharing the business money earning opportunity of the company. You will need to spend about 2 hours a day chatting to people, getting to know their needs and desires and then showing them how can help them full their needs. (I) The investment side is NOT heavy on the budget when using the Supporter Compensation Plan. For a mere R125 per month (R100 for the products and R25 for the business licence and first month is R175 due to admin fees) you are investing your money into an wealth BUILDING investment! Like a pension plan except better as this 'pension' plan GROWS every time a member joins your team. (B) is where the Compensation plan fits firmly into place. It is a WEALTH BUILDING system where your payment into your investment turns around and starts PAYING YOU when you get your team together and when the team starts working for YOUR income. When you introduce new clients and they join in with the company, you get rewarded for introducing them with referral income or residual income (income that pays out without you have to work for it anymore, like interest paid TO YOU from an investment). You will be paid R5 per month for every new client you personally get to join PLUS a R50 'smile' bonus. R5 doesn't seem like much right? BUT WAIT, there's more! When those Clients you have referred to the company start creating their own wealth building teams, you earn money from THEIR team! From their first level clients YOU earn R10 per month each! and from their second level clients you earn R5 per client each. What does this look like in a table? Their clients = Your level 2 and so on. Your levels income depends on how many personal introductions you make. Level 6 = 4096 people @ R9 each = R36864 income. If you add all those levels together you will receive R43 764.00 INCOME PER MONTH!!!!! And this is for only an investment of R125.00 per month and bringing FOUR new clients to the company! If you bring a fifth client to the company, the company has some WONDERFUL bonuses for you!!! They are a registered Financial Service Provider (FSP4440) and approved by the department of trade and industry (DTI) (Certificates available on request). The founder and CEO, Mr Kobus Geldenhys, whom I have met personally, came up with a concept of 'creating a better lifestyle for families'. The motto stands for "SUCCESS through DETERMINATION creates LONG-TERM wealth" and it provides the vehicle to take you to a self sustaining monthly income. What products are in the Supporter Package? Because of the number of members, they have managed to the the very best rates for their members. WOW!! That means the products are fantastic AND will bring me a steady income! BUT THERE IS MORE!!! Your income can be left in your will to your nominated beneficiary! That means if you die, your family will STILL BE EARNING YOUR MONEY!!!!! So now you have the information! What are YOU going to do? Be an (E) person earning money for your boss, if you even have a job? Or are you ready to step into the challenge and security of the investment world and create an asset that will pay you for the rest of your life? Don't wait! Choose to join our team NOW. The sooner you join, the quicker you can spend more time with your family and friends, doing things YOU have dreamed about! You do need to have a South African ID number and a Bank account that accepts debit orders for your premiums and income transfers. If you have those then ask me NOW for an application form to join this incredible company!